ClayHouston supports Houston artists working in ceramics. We provide educational opportunities, creative activities, and social groups. We would be delighted for you to be a part. See the "Membership" page for more information. Empty Bowls Houston is gearing up for its 15th annual event which helps the Houston Food Bank battle food insecurity in the Greater Houston area. This year’s event is Saturday, May 18th from 11-3 at Houston Center for Contemporary Craft, 4848 Main Street. Artists are invited to create and donate soup-sized bowls which will be sold for $25. For each bowl purchased, the Food Bank can provide 75 nutritious meals. Larger bowls are also accepted and priced accordingly. Since the inception of Empty Bowls Houston, artists like you have helped provide over 2.6 million meals! A Preview Party will be held on Friday, May 17th from 6-8 at HCCC. Attendees purchasing an admission ticket for $50 will have first choice of the bowls and enjoy light bites, drinks and craft camaraderie. To donate bowls, artists may bring them to the Ceramic Store or HCCC from May 1st to May 16th. For the event Volunteers Needed. Join us for gallery talks by exhibition MFA artists. Tuesday’s talks feature: Rafael Gamero, Amanda Shilling, Sunni Forcier, Erin Carty, Jinyong Choi, Melissa Noble, Jimmy Castillo, and Derek Witucki. Exhibition continues through Monday, May 27th. 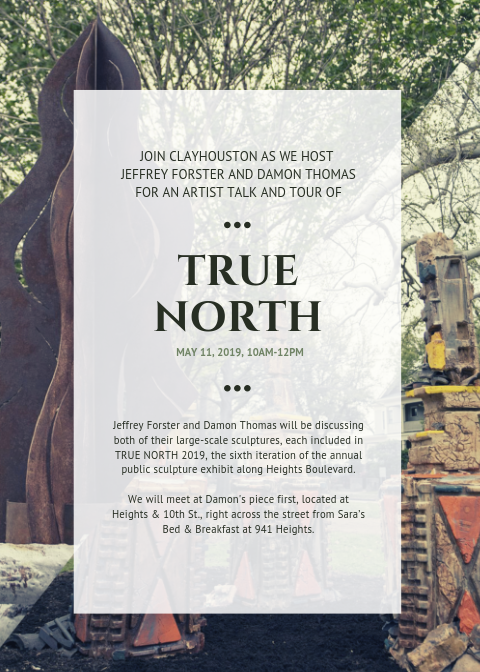 See the ClayHouston Calendar for more information on these and other upcoming events!